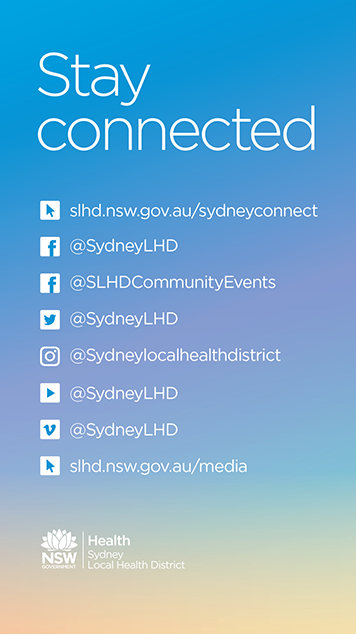 SydneyConnect is a digital publication produced by Sydney Local Health District. It is one of the many ways we connect with our community. Here we provide information about our health services and how they work, promote events and ways people can get involved, highlight great career opportunities, share some of the experiences of our patients and their families, post updates on what’s happening and give user friendly information about how we can all live healthy. We are always looking for new ways to share our stories with our healthcare community. And, by healthcare community we mean our patients, their families and friends, our local community, our staff and our partners. We provide services to around 700,000 people living in Sydney Local Health District* (and outside our District) and we are one of the biggest employers in NSW – did you know, around 12,000 people work as part of our team? We’re living in a time of rapid change for our health system – right now we’re part of a great digital transformation of our hospitals and healthcare services. Digital media has changed the way we all communicate and look for the information we need. As a public health organisation it is allowing us to keep finding new ways to improve access to health information and services. We’re proud of our reputation for providing the best information we can to our healthcare community, we aim to keep building opportunities like SydneyConnect to share our stories (and yours). Here you’ll find messages, stories, interviews and more in video and podcasts, images and text. We value feedback from you and encourage you to get in touch with us by email SLHD-SRC@health.nsw.gov.au with your ideas and contributions. Sydney, it’s your local health district.